Mexican Tile "Dark Blue Lizard"
Mexican tiles in "Dark Blue Lizard" style. Antique with yellow talavera tile design over dark blue background. Shipping from Mexico to the US and Canada is estimated for four weeks. 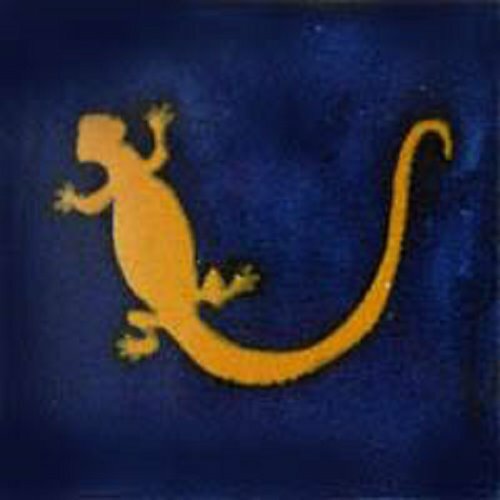 I ordered blue gecko and yellow gecko tiles to mix them up with solid color terra cotta. All three colors are very Mexican as it is my entire kitchen. In general, my house was designed in kind of modern hacienda style with a lot of rustic furniture and accents inside and outside patio. I didn't want to have my kitchen typical colonial but more like happy Sothern flavor added. Mexican gecko tiles or as some call them lizard tile pattern were perfect choice. My eat-in kitchen space looks lovely. Shipping was free but it took more than three weeks to deliver my tiles from Mexico to Miami Beach.